Back in July I blogged about the West Papuan's who hoped that David Cameron might be the hero they were looking for. Cameron let the West Papuan independence movement believe he supported their aims. I finally received a response from Cameron's Foreign Office*, via my MP Andrew Smith, a copy of which I'm inserting here. "The UK supports the territorial integrity of Indonesia and does not support the calls for independence of the provinces of Papua and West Papua. This has been the policy of successive governments and it remains unchanged by the current Government." 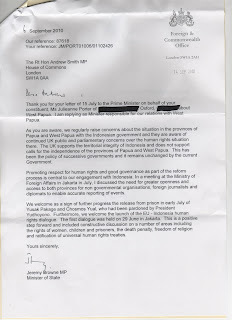 So no, Cameron isn't going to do anything about the terrible situation in West Papua. And Indonesia can continue to attack and destroy West Papuan's and their homes, or just outright murder them. *The letter comes from Jeremy Brown, Minister of State, on behalf of Cameron and his dodgy government. Thank you for your letter of 6 September 2010, your reference 87618. I am delighted to hear your report of your effort in the Indonesian domestic affairs of human rights, but I again ask you about UK foreign policy. Does the UK support the United Nations goals of global welfare and principles of lawful process?Are the principles of lawful process beneficial to UK foreign relations? Were UN General Assembly resolution 1752 (XVII) and the UK vote in accord with previous resolutions 1514 and 1541 (XV), the UN charter and the Universal Declaration of Human Rights? 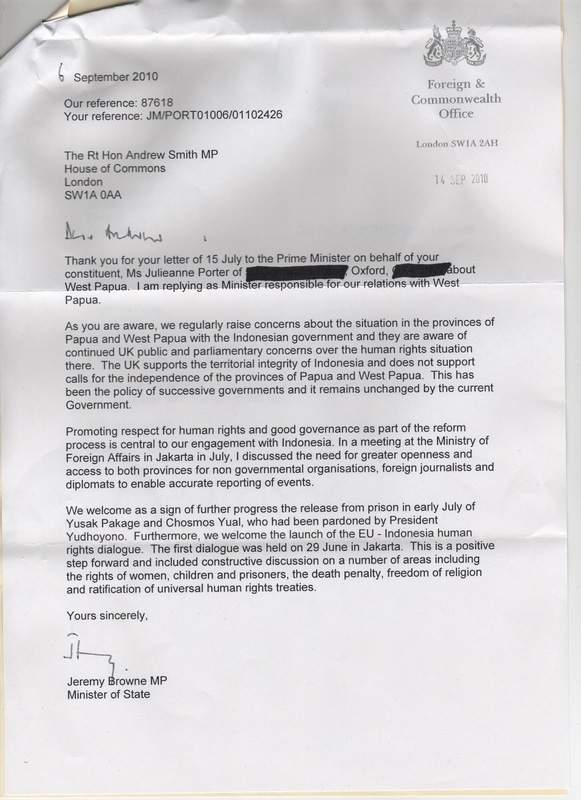 Does the UK object to the International Court of Justice being allowed to provide advisory opinion on the legality of international agreements and the sovereignty of West Papua? I look forward to your answer to my concerns.